Truth is Concrete 24/7 marathon camp on artistic strategies in politics and political strategies in art organized in Graz, September 21-28, 2012. I am contributing with two network maps below –being exhibited in the hall– and a tactic talk titled “Network as a Medium of Critique and Action” on Sep 25 Tuesday, 8pm at Black Cube. Truth is Concrete participants were asked to provide a list of other marathon participants that they’ve worked with in the past. 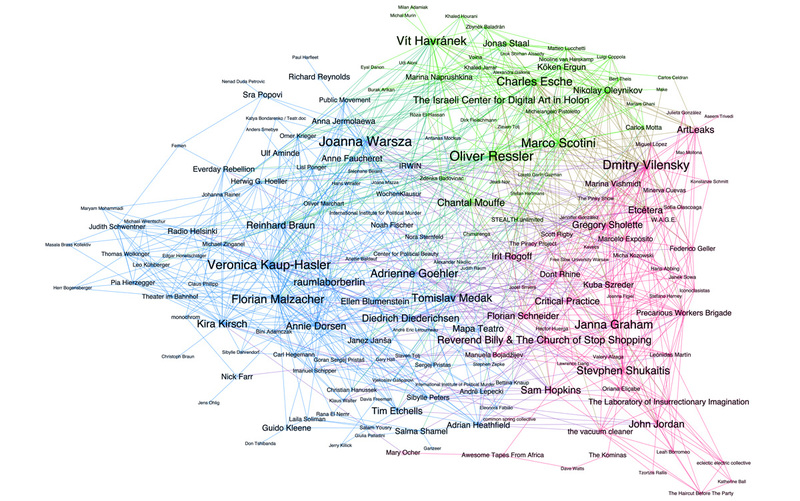 These lists of collaborators are then turned into a network map of collaborations. 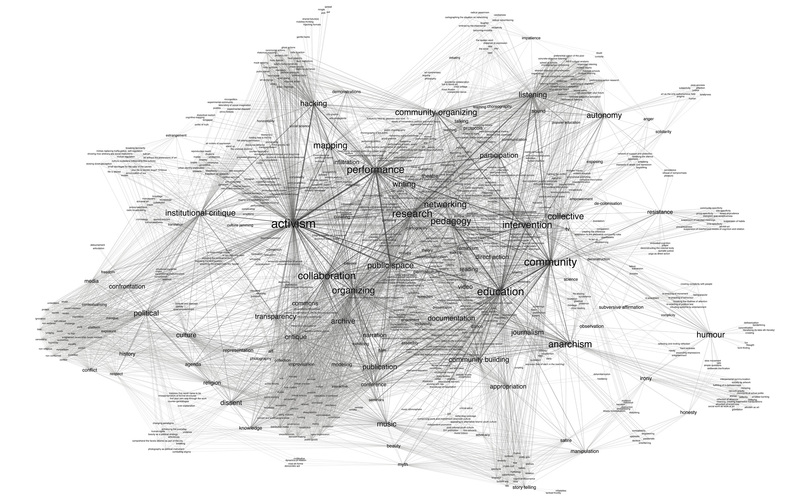 The map includes 186 names connected via 1030 lines that represent collaborations. The size of the names is based on “betweenness centrality”, a metric to show how often a node appears on shortest paths between nodes in the network, often referred as “bridge quality”. Colors represent clusters based on the density of inter-connectivity, which describes how the network is compartmentalized into sub-networks or communities. The network map organizes itself by running as a software simulation, where the names naturally find their position on the canvas through connecting forces, revealing the central actors, indirect links, tight clusters, structural holes, and outliers. Each participant in the Truth is Concrete marathon was asked to provide a list of tactics they’ve been using in their practice. These lists of tactics are then turned into network map of 749 unique tactics connected through shared use. The size of the tactics is based on “betweenness centrality”, a metric to show how often a node appears on shortest paths between nodes in the network, often referred as “bridge quality”.